Your invoice software should keep invoicing simple and make your life easier. Try Zoho Invoice, cloud invoice software that helps you send out simple, professional invoices and get paid faster. 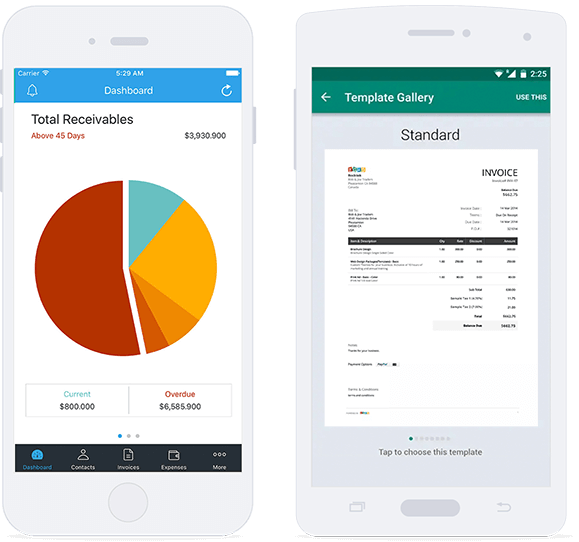 What makes Zoho Invoice a simple invoice software? Cluttered interfaces are a pain. Zoho Invoice has a simple and fresh interface to get your invoicing up and running instantly. You can also choose which modules you require and remove the ones you don't. Craft and customize every detail before sending out simple, professional-looking invoices. Zoho Invoice has a gallery of attractive templates for you to choose from. Make business interactions easy and convenient for your clients. Enable customers to view their invoices, make payments and much more using the client portal. Keep track of time effortlessly using Zoho Invoice's built-in time tracker. You can create invoices from your recorded hours in a single click. 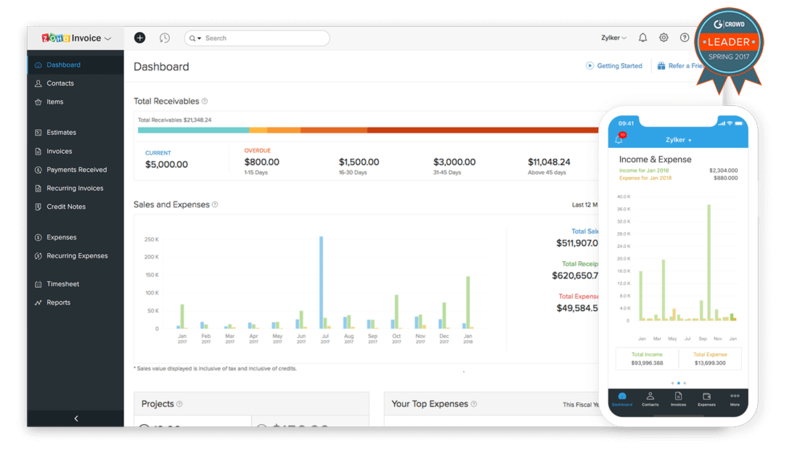 Capture and manage your organization's expenses. Automate your expense management to save yourself the tedium of manually adding expenses. You can even convert billable expenses to invoices in a click. As a cloud invoice software provider, we prioritize data security. You can rest assured that your data will be secure and you will be the sole person with access to it. Read more about our security policy. Ready to try out the best simple invoice solution? Invoice on the go with mobile apps for all platforms. "I was looking for a simple invoicing solution. This is EXACTLY what I was looking for! Even if this app/software was free, I would still donate cash every time I made money." Streamline your billing and start sending easy invoices using Zoho Invoice. Can I send my invoices to multiple recipients? Yes, you can send invoices to multiple recipients. Can I get Zoho Invoice for free? Yes, Zoho Invoices does have a FREE plan. If you are business with just one user and upto 5 customers, you can get Zoho Invoice absolutely free. Head over to our pricing page to learn more. Does the software have the option to add my logo to my invoices? Yes, you can customize the invoices according to your business needs and choose from an extensive gallery of templates. Can I add both the "bill to" and "ship to" addresses on my invoices? Zoho Invoice lets you add both "bill to" and "ship to" addresses and lets you customize your organization address format as well. I send out quotes or estimates before I complete a deal. Can I do that? Zoho Invoice gives you the option to send out professional estimates. You will also be notified when the estimate is accepted or rejected, and can convert the estimate into an invoice in a click. Is it possible to receive advance payments? You can send retainer invoices to your customers and receive advance payments. Later, you can apply this retainer to an invoice as well.